Linda Stein, former co-manager of punk band The Ramones, has been found dead at her Manhattan apartment. A pathologist said the 62-year-old, who went on to become one of New York's leading estate agents, died from blows to the head and neck. 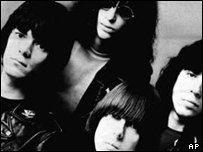 Stein, the ex-wife of Sire Records head Seymour Stein, managed the Ramones with Danny Fields during their 1970s heyday. After parting company with the band in 1980, she went into property. Her clients included Sting and Billy Joel. Long-time friend Sir Elton John told the New York Times he was "absolutely shocked and upset". According to the newspaper, Stein was the model for the agent who tries to sell Charlie Sheen's character an apartment in the film Wall Street. Born in Manhattan, she worked as a teacher before a blind date with Seymour Stein brought her into the music business. The record mogul would later tell Vanity Fair magazine their marriage had resembled "eight years on a roller coaster, and not always strapped in". Stein is credited with arranging The Ramones' July 1976 appearance at the Roundhouse in London, thought to be one of the key moments in the creation of the British punk scene.